Designer, Ground floor Direct Gulfront Phenomenal View! ..in Gulf Shores/Orange Beach... sought after, Beachfront, low density, centrally located, family-oriented condominium (Silver Beach Condominiums). Straight out of 'Architectural Digest' with spectacular, Gulf views in Orange Beach. Our vacation condo home is probably one of the most luxurious and most value priced three-bedroom end corner, ground-floor unit you can find in Orange Beach/Gulf Shores Value for Value! This perfectly located, premium ground floor, end corner, Gulf-front unit has floor-to-ceiling, sliding, glass doors leading from bedroom, dining room, living room, kitchen, and wraparound deck to bring the ocean right to you. It is not your typical, shotgun, layout condominium. Since it is an end-corner unit, it is flooded with sunlight, beach views that makes enjoying the surf of the ocean breeze, and ocean views at its best! No worry of heights or waiting with the crowds for elevators. The Beachfront pool is located just steps away from our condominium unit, yet it is located in a way that does not obstruct the ocean view from our unit. The beach is just 50 yards away from our unit. Parents do not have to lug their little ones plus their beach toys far. The beach is right there! When you vacation in our Gulf-front condo, you are stepping into luxury. Professionally decorated and accessorized with upscale furnishings, granite countertops, custom beddings made with designer fabric, and down pillows for all the bedrooms. For those looking for the best and value....Welcome! Our master bedroom suite offers luxurious, custom bedding with a superbly comfortable, king-size bed. The second bedroom offers a very comfortable, queen-size bed with custom bedding. The third bedroom suite offers two, premium, very comfortable twin-size beds with custom bedding. All of our bedrooms are furnished with DOWN pillows! The living room has a queen-size, sleeper sofa. Our granite countertop kitchen is well stocked down to an electric pancake griddle for cookin’ those flapjacks. There are multiple TVs and VCRs, a CD player, stereo, and more. Linens, towels, etc. are provided. Watch gorgeous and romantic sunsets from your light-filled, living room or in the spacious, wraparound balcony while you sip your favorite afternoon beverage. You can fish, swim, or do nothing at all. This is perhaps one of the most luxurious and beautiful, three-bedroom, ground floor, end-corner unit and the Most reasonably priced unit in Gulf Shores/Orange Beach. This awesome condominium is a strictly 'No Smoking' unit. Policy prohibits rentals to anyone under the age of 25. Silver Beach Condominiums prohibit pets. 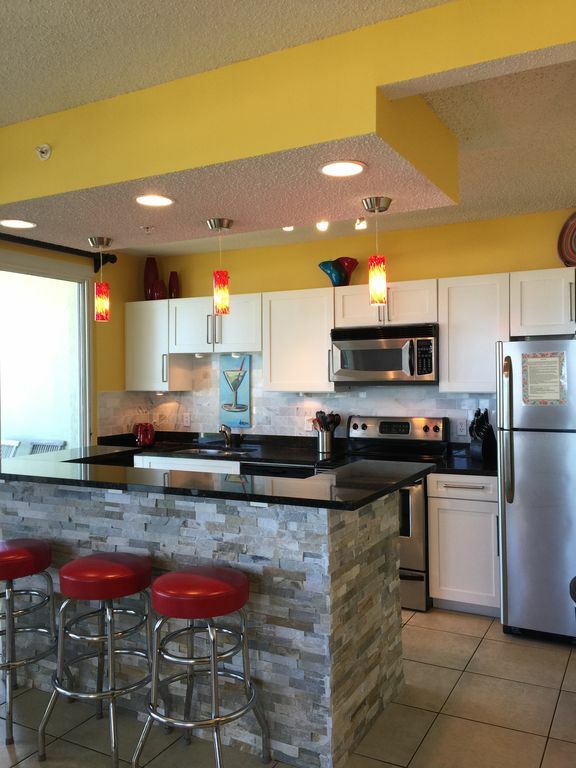 This Oceanfront condominium is primarily located in Orange Beach/Gulf Shores. Across the boulevard (walking distance) you will find multiple restaurants, grocery stores, video rental, and shopping. There are multiple golf courses, wonderful restaurants, outlet mall shopping, and marinas minutes away. Pensacola, Florida is 28 miles. Mobile, Alabama is 48 miles. New Orleans, Louisiana is three hours. 2 full bathroom. One bathroom has walk in shower. The other bathroom has tub/shower. Full Size washer and dryer in our condo unit. Well stock kitchen . Fabulous ocean view. You can see your kids on the beach while cooking! Very clean and comfortable. Beautiful location. Great location. Quiet ...and relaxing for the family. Close to the beach. The location was wonderful and the size of the unit was great. The beds were very comfortable. We were very happy with the location and the owner was very nice to work with. It appears that that these condos may be a little older than some of the others along the beach. Loved every second of our stay! We have 4 children, ages 4-10, so having a ground floor unit was important! Plenty of room for all of us, the kitchen had everything that I needed for meals, but the master bed? Seriously the most comfortable bed I've ever slept in! Publix right down the street... plenty of good restaurants... will be back again this fall. Highly recommend! Our condo location on the end ground floor was a perfect location for us. My 2 small grandsons loved the beach, it was so close to walk out our door. The 3 bedrooms 2 baths worked perfect for the 6 of us. Loved sitting out on the balcony & listening to the ocean & enjoying the nice breeze!